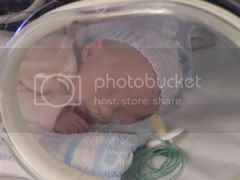 A continuous amount of air, sometimes with added oxygen, is delivered through tubes in the babies nose to keep the airways of the lungs open as baby breathes. A bluish coloring of the skin and lips caused by a low level of oxygen in the blood. The material provided here is for informational purposes only and should not replace, or be used as a substitute for, professional medical advice.